Inflight sales have been notoriously difficult for airlines to maximize. It’s hard for customers to want to make additional purchases after they have paid a hefty fee for their ticket, paid for their checked bag, and potentially paid to get just a few inches more of leg room. After all those purchases, it’s hard to get more out of passengers – especially for non-essential duty-free options. So how is it that Korean Air has figured out how to blow away inflight sales numbers and become the most successful inflight retailer? In southeast Asia, duty free shops aren’t just found at the airport. In countries like China, Japan, and South Korea, duty free shops are incredibly popular staples in downtown shopping. Chinese travelers – the main target for retailers in Asia and the Pacific – sparked the surge in duty free options. Korea started the trend in a tax-free system to attract these travelers and countries like Japan and Singapore are following suit with their own booming downtown duty free shops. In our previous Sky Stats, we’ve covered ancillary revenue breakdowns for the specific categories that airlines are bringing in the most revenue from. In global carriers, inflight sales or services were lumped into an “other” category, while in low cost airlines, carriers like EasyJet only could count on onboard sales & services for 8% of their total ancillary revenues. Compare this to Korean Air where just their duty free inflight sales totaled $168 million – 15% of their total ancillary revenue for 2016. 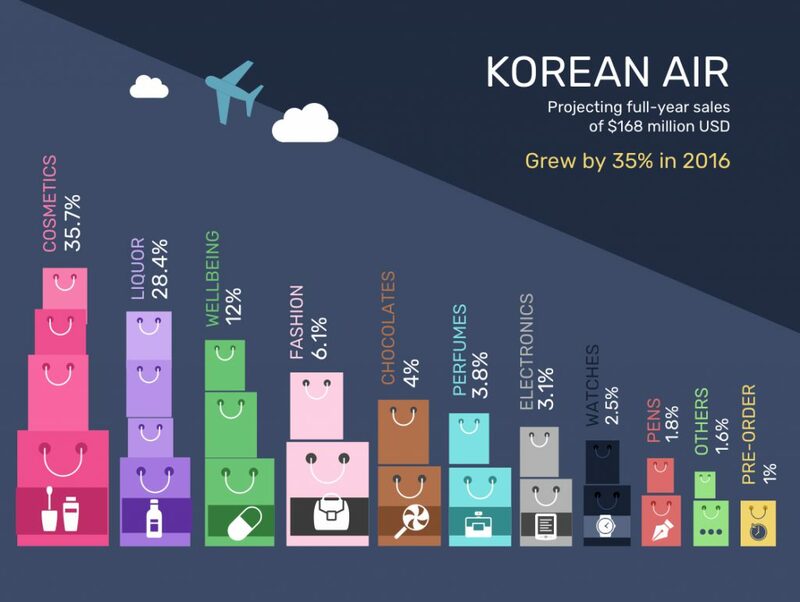 Considering over half of Korean Air’s routes are in southeast Asia alone, this could account for why duty free sales are so high compared to others.